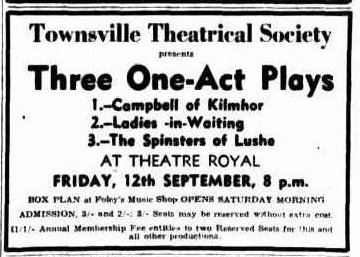 Apart from a one-act play produced especially for the Woman’s University Benefit Concert in Aug 1947, the first appearance by the Society were with 3 one-act plays “Campbell of Kilmohr”, Ladies In Waiting”, “Spinsters of Lushe” at the Theatre Royal on Friday 12, and Saturday 13 Sept 1947. The Townsville Theatrical Society, which makes its first public appearance in the Theatre Royal on Friday and Saturday nights, staged a full dress rehearsal last night and the players acquitted themselves in brilliant fashion. There can be no doubt about the success of the movement. 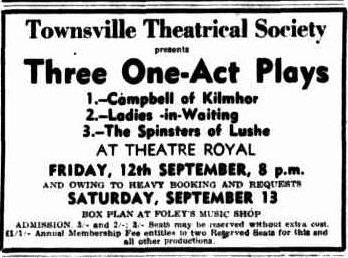 The three one-act plays staged were 'Campbell of Kilmohr,' produced by George Wiedemann, 'Ladies-in-Waiting,' produced by Val Illich, and 'The Spinsters of Lushe,' produced by Mabel Pingel. 'Campbell of Kilmohr' is an historical costume play, set in the back-ground of the second Jacobite Rebellion of 1745. Bonnie Prince Charlie, defeated by an English army, fled for safety to the Highlands. The play deals with the loyalty of the Highlanders who risked their lives to save that of their handsome young leader. This play is full of dramatic situations. 'Ladies-in-Waiting' is a modern sophisticated comedy which deals with a real-life problem. It has its moments of comedy and its moments of tense emotional drama. 'The Spinsters of Lushe' is a costume comedy with its setting in the village of Lushe during the period of the Napoleonic wars. There is rich, hilarious humour in this play about the elderly spinsters and their very human, very likeable, and very humorous failings. The scenery for these plays has been designed and painted, with the help of member of the Society, by George Wiedemann. This work called for a man who combined the ability of an artist with the knowledge of an architect. Mr. Wiedemann has proved to be such a man, and the scenes depleting the interior of a Highland cottage, a hospital waiting room and an early nineteenth century drawing room, all accurate in historical detail. They are well-designed and well painted. Costumes also have been checked for historical accuracy and an interesting, colourful entertainment is provided. 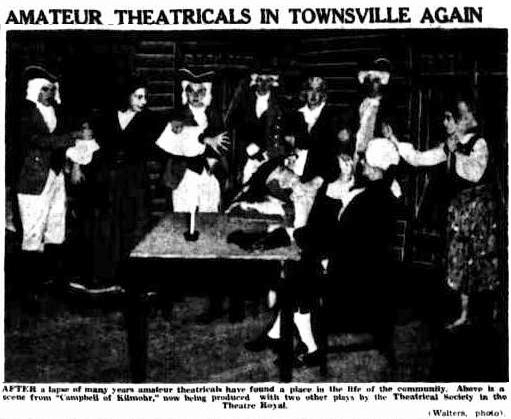 Townsville Theatrical Society players at the Theatre Royal last night, set out to stage a revival of the living theatre— and their efforts can be described only as an outstanding success. The Society’s debut was ??? somewhat remarkable for the standard of production and an ability displayed throughout the one-act plays. The entire show and settings, costuming, and production was well on a par with presentations by little theatre companies in Sydney and Melbourne. This journal's representative has witnessed many offerings by small groups of performers and cannot recall any that revealed such a wealth of talent. The Society is most fortunate in that it can command sufficient actors and actresses to present the short plays with different casts. Players interpreted their roles with the aplomb and poise that ??? witnessed in this type of company. That in fact, was the outstanding feature of the night. With any company but more particularly with a society giving its initial Performance, nervousness and some raggedness is usually discernable on first nights, but not with these players. The smoothness of production was a tribute to the technical directors and the enthusiasm of the Society's members who must have staged exhaustive rehearsals to reach the standard attained last night. The Society’s executives showed wisdom in asking no more than one performance from their players for their first public appearance: short plays have, however, their limitations. With last night's show can be recommended as good entertainment for those who desire not to have their entertainment and intellectual horizons bounded by talkies and the radio, the show is obviously but a foretaste of what is to come when the Society stages a full length play. Few stage groups have the variety of talent from which to select as the Townsville Society. Male actors showed confidence and the polish of seasoned performers; but it was the female side of the casts, possibly because they are stronger numerically, that provided a wide range of talent. Several have a natural flair for comedy— most difficult of all stage work— that promises much good entertainment for the future. Because of the evenly distributed roles, and general high standard of acting this reviewer has no intention of singling out the best actors and actresses from each of the three plays. But this resolve must be broken in one instance — the company has a comedy 'find' in Miss Lettie Mills, a character actress who had little to do in her role of the garrulous visitor in 'Ladies in Waiting.' but carried off her part with the slickness and assurance of a veteran performer. A natural comic, her gestures, timing, and restraint in a role that easily could have been over-done were attributes that will have audiences watching for her next effort in a part that would give her full scope. Whether this player has had previous experience or not could not be ascertained last night, but she is certainly a valuable asset to the Society. Dressing, costuming, and stage settings were most outstanding: those responsible are to be congratulated on a very fine effort, because it is these factors that make or mar a stage show. The first play of the night, 'Campbell of Kilmhor', a story of the stirring days of Bonnie Prince Charlie and produced by Mr. George Wiedemann, gave the house an example of the players' dramatic ability. Settings were excellent and created the correct atmosphere. Featured performers were. Nina O'Sullivan, Janice Hamilton, Erie Rees, Arthur Krause, Joe Anderson, and William Anderson, with Kingsford Arrowsmith, Noel Saxby, Dour Stortenbecker, John Walker and Gordon Whiting in supporting roles. The audience responded with marked enthusiasm to this offering. 'Ladies In Waiting.' a drama well punctuated with comedy, received, perhaps the biggest 'hand' of the night. Every member of the cast gave a polished performance and it was first-class entertainment. Players were, Maureen Laverty, Sadie Williams, Shirley Winkler, Val Illich, Irene Melvin, Shirley Davidson, and Lettie Mills. Production by Val Illich. A comedy 'The Spinsters of Lushe' was outstanding not only for the sustained acting of the performers, but for superb settings that were superior to those usually seen in presentations by local companies. Frocking was authentic and the actresses created the atmosphere of the period in admirable fashion. The cast was; Mavis Donald, Gloria Boyce, Winifred Bubb, Gertrude Pohlmeyer, Molly Walsh and Ailsa Thomson. Play was produced by Mabel Pingel. The Townsville Theatrical Society's first offering against demonstrates that Australia is rich in talent, and that entertainment can be created within local confines that can afford keen enjoyment and variety. The living theatre has been revived in this city in most successful manner; the company's efforts are a gesture to culture and a tribute to what opportunity can draw forth from local players. This is only the beginning. There are many well-known plays that have scenery within the compass of small theatrical groups, and Townsville can look forward to some first-class shows when this Society gets well launched. The public will have a further opportunity of seeing the present show as it will be staged again to-night. Credits are due to the following for outstanding work: Stage manager and settings, Mr Geo. Wiedemann: Make-up Miss Duncan and Mr. Costello; costumes, Mrs. Hamilton and Mr. W. Cook; electrical effects. Mr. William Anderson. Messrs. J. Burnett and P. Elliott and Mrs. E Dawson supplied musical interludes. AFTER a lapse of many years amateur theatricals have found a place in the life of the community. Above is a scene from 'Campbell of Kilmohr.' now being produced with two other plays by the Theatrical Society in the Theatre Royal. (Walters, photo). Featured performers were: Nina O'Sullivan, Janice Hamilton, Eric Rees, Arthur Krause, Joe Anderson, and William Anderson. Supporting roles were: Kingsford Arrowsmith, Noel Saxby, Dour Stortenbecker, John Walker and Gordon Whiting. 'Campbell of Kilmhor' is an historical costume play, set in the back-ground of the second Jacobite Rebellion of 1745. Bonnie Prince Charlie, defeated by an English army, fled for safety to the Highlands. The play deals with the loyalty of the Highlanders who risked their lives to save that of their handsome young leader. This play is full of dramatic situations. Players were, Maureen Laverty, Sadie Williams, Shirley Winkler, Val Illich, Irene Melvin, Shirley Davidson, and Lettie Mills. The cast was; Mavis Donald, Gloria Boyce, Winifred Bubb, Gertrude Pohlmeyer, Molly Walsh and Ailsa Thomson. Musical interludes….Messrs. J. Burnett, P. Elliott, and Mrs. E Dawson.